4 Pics 1 Wrong For all fans of Icomania, Whats The Pic and 4 Pics 1 Word! Meet the new interesting intellectual test and addictive picture game 4 Pics 1 Wrong and find out why the whole world loves this great brain teaser 4 Pics 1 Wrong! 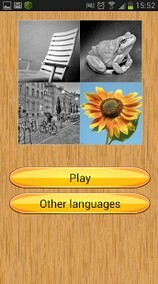 The rules of 4 Pics 1 Wrong:4 pictures, 3 of them are somehow connected with each other and 1 is not fit. Solve the puzzle, find out the odd picture and fill in the blank with the correct word – the sign, by which you’ve chosen this photo. 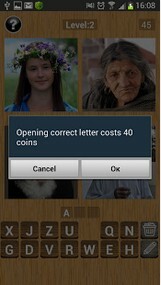 You’ve got two kinds of hints – remove letters or reveal letters. 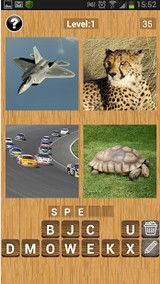 4 Pics 1 Wrong Features: • Guess the Wrong Pic. Guess the word; • Awesome colorful pictures; • A lot of fascinating levels of various complexity; • Multi-language game (English, German, Russian, Italian, Spanish, Portuguese); • Exciting photo quiz for kids and adults; • Free App. Lots of hardest levels in 4 Pics 1 Wrong for you to check your logic and wits! Make your brain solve these difficult riddles! Good luck!